About 2 miles of shoreline were restored to pristine condition. This section had never before been targeted because of the complex logistics. 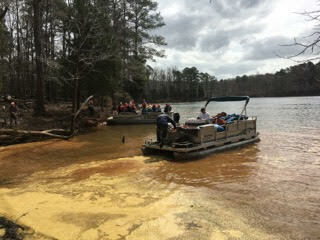 Volunteers had to first drive to a remote Jordan State Park service road, walk down a steep hill to a tiny cove and load onto boats. Three of the five Trash Treasure Hunt items were found and redeemed for great prizes from REI, Great Outdoor Provision Company and the Pittsboro Roadhouse. Jon Bannerman of the U.S. Army Corps of Engineers works closely with us throughout the year in our official partnership with the Corps. He was one our pontoon boat operators for this event and also a great help in making our experiment with Chatham County's new single stream recycling program a success. Some of our volunteers were assigned to collect recyclables by turning their orange DOT bags inside out to reveal the blue side. The blue bags were brought back to the Corps dock by our boats along with trash bags and tires. Corps staff and volunteers emptied each bag into a special recycle container provided by Chatham County. Our volunteers removed 153 bags of trash, 30 bags of recyclables and 52 tires in 2 hours. We hope to continue the recyclable program in future events. Thanks to everyone involved!